A new WRI study finds that there are many “win-win” opportunities for the United States to reduce emissions and save money for consumers and businesses. Over the coming weeks, our blog series, Lower Emissions, Brighter Economy, will evaluate these opportunities across five key areas—power generation, electricity consumption, passenger vehicles, natural gas systems, and hydrofluorocarbons—which together represent 55 percent of U.S. greenhouse gas emissions. Homes and commercial buildings account for 74 percent of electricity demand in the United States, making them a critical part of any plan to reduce greenhouse gas emissions. 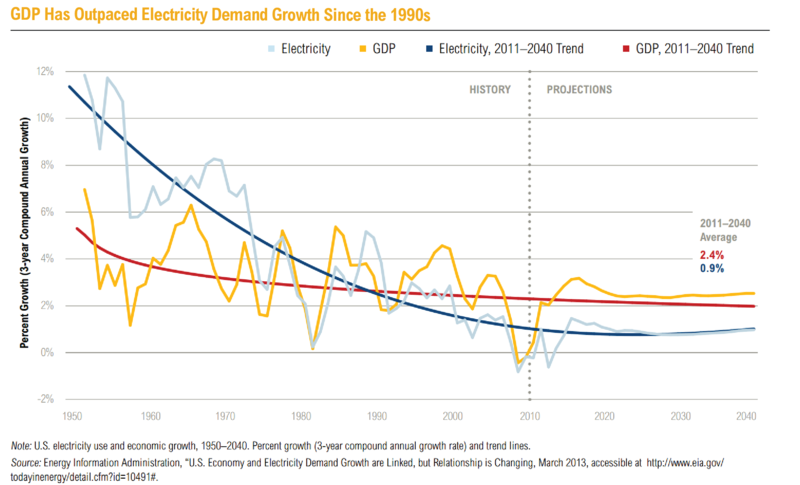 The good news is that policies put into place over the last three decades—including appliance efficiency standards, voluntary labeling programs like ENERGY STAR, and state energy-savings targets—have already helped offset rising demand for electricity and saved consumers billions of dollars. New research shows that with the right policies in place, consumers and the environment can capture even greater benefits. American consumers have seen massive savings from energy efficiency programs. Federal appliance standards implemented since 1987 saved consumers nearly $370 billion USD in lower utility bills as of 2012, and are projected to save another $570 billion USD through 2020. And state programs that help improve the efficiency of homes and businesses regularly save consumers $2 USD for every dollar invested, in some cases as much as $5 USD. And the benefits go beyond the savings seen by those who buy efficient products or upgrade their homes. When electricity demand goes down, utilities can avoid investments in new power plants and other infrastructure, saving money for all electricity customers in the region. The local economy benefits when consumers buy other goods and services with the money they saved on their bills. Plus, less power generation can lead to better air quality and improved public health. Energy efficiency investments of $440 million from 2009-2011 as part of the Regional Greenhouse Gas Initiative, a cap-and-trade program for carbon dioxide emissions from power plants among nine states in the Northeast and mid-Atlantic regions, are expected to add $1.6 billion in economic value and create 16,000 net job-years (a measure of employment that means the creation of one job for one year) in the region through 2021. The lifetime public health and economic benefits of Massachusetts’ efficiency programs implemented from 2010-2012 are expected to reach $4 billion USD. Wisconsin's energy efficiency program is projected to add more than $900 million USD into the state’s economy and generate 6,000 new jobs over the next 10 years. The cost and climate benefits of reducing electricity use are clear. The problem is that market barriers and misaligned incentives prevent the widespread adoption of efficiency measures even when the benefits well outweigh the costs. This leaves a surprising amount of potential untapped—studies by the National Academy of Sciences, Rocky Mountain Institute, and others suggest that the United States could reduce electricity use 14 to 30 percent below projected levels over the next two decades by putting cost-effective efficiency measures into place, generating hundreds of billions of dollars in savings for consumers. One of the biggest challenges is that utility profits are typically linked to how much electricity they sell. That means profits decline with sales revenue as efficiency programs expand, creating natural disincentives for utilities to pursue cost-effective energy efficiency. Breaking the link between revenue and sales can encourage utilities to take advantage of energy efficiency as a resource. Over the past several years, some states have taken steps to do just that—16 now have policies that decouple utility profits from sales, 28 offer utility incentives for efficiency, and 24 have mandatory electric savings targets. But many other states are missing out on these opportunities. Even with these advances, states need new federal policy signals to truly capitalize on all the efficiency opportunities before them. This is where EPA’s greenhouse gas standards for existing power plants could play an important role. Proposed standards would allow states to use efficiency programs to comply with mandatory emissions limits. By finalizing ambitious and flexible standards, EPA could encourage more widespread adoption of state efficiency policies. States and federal agencies should improve access to low-cost financing for efficiency projects, such as states’ adoption of innovative financing models like “green banks”. Tune in for our next installment of the Lower Emissions, Brighter Economy blog series, where we’ll explore the economic benefits of cleaner and more fuel-efficient vehicles. See also our related publication, Seeing is Believing: Creating a New Climate Economy in the US.